If you’ve done any bit of research about the ketogenic diet you’ve probably come across the fact that the first week is the hardest. We touched on this in our first post about our keto updates which you can check out here. What’s incredible once you get past that first hump is that you’re most likely, at least in our cases and people we know who have tried it, going to level out and feel pretty normal once you hit week two. But we didn’t want to leave you all hanging. We adventured through week two and here’s what we can tell you about it. Honestly, I don’t have much to report for this week. I felt some tiny symptoms from week one but nothing major at all. I really did feel basically normal if not better. I had a few sweet cravings but nothing I couldn’t keep control of. Stick with it and if you need a little something sweet, have a little no sugar whipped cream and keep truckin’ along. Ah, if only it was as easy for me as it was for Nick. But I can honestly say week two was much easier than week one. There’s no doubt about that. I quickly began to realize that in this transitional period my first meal was super important. If I didn’t have broccoli or some type of veggie carb I would feel hungry sooner between meals and feel like I had a dip in mental clarity and energy. So, I started to really make sure that I had enough veggie carbs and fats like extra virgin olive oil in the mornings. It really made the difference. The strange thing that happened for me during week two was that I passed a small kidney stone during a trip to the bathroom. Luckily it was teeny tiny and wasn’t horribly painful but not something I could miss. I have passed a couple of kidney stones in my life, so I was thankful it wasn’t too bad. We still aren’t sure exactly why a stone would have formed but we have a few guesses. Having passed kidney stones in the past, I am more prone to them moving forward – it could have been as simple as that. It could have been that even though I was trying my best to stay hydrated I wasn’t keeping up with the flushing out or “whooshing” of my water weight. Dehydration is often a cause of kidney stones because the body doesn’t have enough urine to keep salt levels down and therefore allows stones to form. So, try as I might I still wasn’t as hydrated as I needed to be. Or it could have even been that a stone was already forming in my kidneys when I started keto and was just coincidentally flushed out during the second week. We might never be able to pin it down. Needless to say, I would guess this was just a rare occurrence related to my health history but still another reason to encourage you to stay hydrated! Unfortunately, the pain stayed with me a day or two after, but I researched some natural remedies to get me through. If you have had kidney stones in the past or are just concerned about it you can combine a dash of baking soda in 8 oz of water and drink that daily. This really helped me after passing the stone to ease the pain and this has the ability to dissolve any other small stones. Other than that fun experience, I can report that week two was great! So many people say to us, “how can you give up sugar? !” and we say, “it’s easy!”. Why? Because you don’t have to give up things that taste sweet altogether. Yes, you may be giving up sugar, and you shouldn’t let your sweet tooth run wild, but you can substitute sugar with sucralose or other natural sweeteners. So, don’t despair. Click on over to the Pinterest haven of keto friendly dessert recipes like we did, and you’ll find all sorts of things to keep you happy. We’ve found a few recipes in particular that we love and will be sharing in some upcoming posts so keep an eye out! Here are some helpful tips to get you through week two! We’ve said it before and we’ll say it again – stay hydrated! Like last week – when you drink, drink electrolytes to supplement the flushing out of vitamins you may experience. We really like Ultima Replenisher Electrolyte Powder which we picked up from our local Sprouts store. Make sure to pay attention to your body and what foods it thrives on. Keep tracking your meals to help yourself understand what quantities and which foods are best. You won’t have to track your meals forever but it’s a big help! Like we’ve mentioned before – we use My Macros+, a super helpful app that keeps track of your food and calculations. Since we can both happily say that once we got through week two we really didn’t feel much of a difference moving forward. 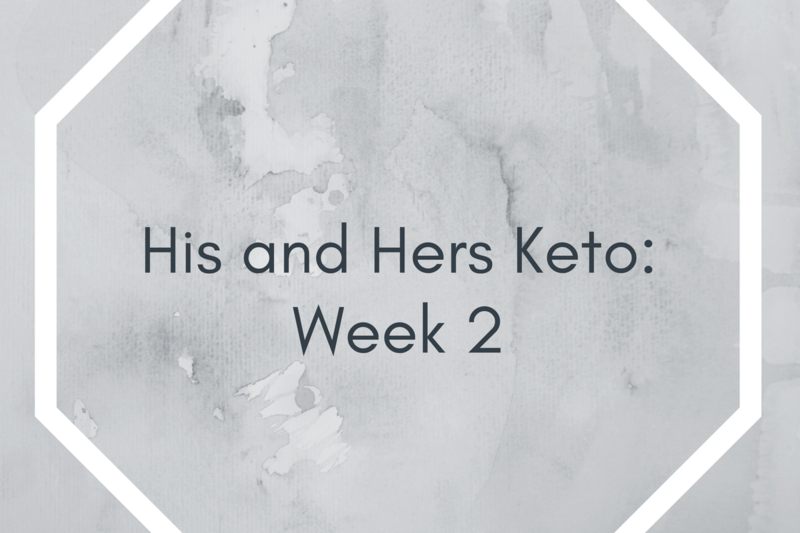 This will be our last weekly keto update, but we’ll be sure to check in later if we come across any other interesting findings as we keep going. Be sure to send us your questions or share your own experiences in the comments below or on our social pages! What causes kidney stones? Find out here. If you search “keto” and “kidney stones” you’ll likely stumbled upon a lot of misinformation, image that. Here’s an article we really like that gives some great information about the low likelihood between the two.